Discussion in 'The Beautiful Game' started by peterhrt, May 24, 2018. In today's Guardian yet another proposal to make the richest clubs richer still. A counter-proposal, imagining just for a moment a fantasy world where football was more important than money, and most games actually meant something. * Reduce all domestic league divisions to 16 teams maximum. 30 matches a season September to April. No play-offs. No player transfers during season. * Only one domestic cup competition per country. * Champions League. Top 4 European leagues provide league champions and domestic cup winners only. Eight more places open to league champions of other countries via knockout qualification. Four groups of four. Group winners progress to semi-finals. * Europa League. Runners-up of Top 4 leagues plus champions of countries not represented in Champions League. Straight two-legged knockout, no seeding. Alternatively scrap the competition altogether. * Copa Libertadores and African/Asian equivalents. League champions only. Two-legged knockout. * World Cup. Qualification 30 groups with winners only making the final tournament, along with hosts and holders. Eight groups of four with group winners progressing to quarter-finals. * Euros, Copa America and African/Asian equivalents. Straight two-legged knockout with no seeding. Stage every four years. * Scrap all other competitions. The KNVB directorate made the prediction the plan is to move it towards a golf, tennis, Formula One situation where a select group of clubs and/or national teams tour the globe. It's not unthinkable clubs like Boca Juniors will be shoe-horned in as part of the plot (horror!). FIFA is trying to move the Nations League and Champions League beyond european teams. It looks as though something has to give. The Champions League in its current bloated form appears unsustainable.The competition runs from June till May, virtually the whole year. Yet only when the knockout stages begin in February do any of the games really matter. 79 clubs enter, which is far too many. Some have not won anything for years. 22 receive a bye into the Group Stage. 47 of the remaining 57 are then eliminated by means of a qualifying process comprising no fewer than 94 matches. That leaves 32 teams. It takes a further 96 group matches to halve the participants to 16, which is ridiculous. To add to the nonsense, eight of those eliminated then enter the Europa League. So only eight out of 32 clubs actually exit European competition after 3 months' worth of group matches. The last round of Champions League group matches occasionally excites, but the preceding schedule is largely meaningless. Who now attaches any significance to Tottenham beating Real Madrid in November? The knockout stages comprise 29 games, producing drama and good football. But the outcome is increasingly predictable. Real Madrid have won four of the past five competitions, with Barcelona winning the other one. During this five-year period, clubs from Spain have provided nine semi-finalists, Germany four, England and Italy three each, and France one. The only other country to provide a quarter-finalist is Portugal. The whole competition consists of 219 matches. Given that several of the knockout ties are effectively over after the first leg, probably only twenty or so games have any actual bearing on who lifts the trophy. Saudi Arabia and partners will take a 49% ownership stake in the (new) Club World Cup and the new Global Nations League (is the plan). That this has implications for a number of things goes without saying. I'd wish Holland was able to sell its national stadium for 1 billion and then re-invest in the foundation and grassroots Instead, even more of a brain drain and muscle drain is to be expected. All competent (youth) coaches are now working abroad... same is happening with Belgium since they've entered the radar. Only once since the Bosman ruling took effect in 1996 has a club from outside the Big 4 European leagues reached the Champions League final (Porto v Monaco, 2004). So the most accurate way to establish the continent's leading club for any given season might be to invite the champions of those four leagues to play off at the end of that season. Two-legged semi-finals and a final at a neutral venue in May. Had this system been in place during the past five years, Bayern and Juventus would have participated every time. Spain would have been represented by Barcelona three times and the Madrid clubs once each. The English representatives would have been Chelsea twice, Man City twice and Leicester once. In 2015 and 2017 both actual finalists would have featured. In 2016 and 2018 neither would have done. Bayern have reached four semi-finals in five years but not made the final. There would definitely have been alternative winners in 2014, 2016 and 2018. It would settle the argument over whether winning the domestic league meant as much as being European champions, since only league title winners would be able to claim the European crown that same season. Szymanski (and Kuper) of the famous Soccernomics book is pessimistic about Holland's long term prospects, for many of the reasons above, in a recent publication. "For four decades the small and culturally idiosyncratic Netherlands had a string of deep runs where only powerful Germany achieved more quarter finals and semi finals. Despite always being studied and continuous spillover effects, why were the Dutch people so extremely innovative in football for decades? For large part because of the coincidental meeting of two minds on 22 January 1965, the day that Rinus Michels as the new coach of semi-professional club Ajax tuffs in his second-hand Skoda to stadium De Meer, and there had the luck to find the seventeen year old 'Jopie' Cruijff. Michels was the first Dutch trainer to have the audacity to set the bar at Western European top level. If he wanted to compete with countries with larger talent ponds, he would have to be innovative. From 1970 to 2010, the Netherlands was therefore the smartest football country. Even if the Netherlands manages to reconnect to the network in world football, it will probably never reach the international top again. Once the top gets smart and spend big, small countries barely have a chance. The golden Dutch years from 1974 to 2014 - three World Cup finals and five semi-finals in eleven World Cup tournaments - are probably gone forever." The agenda to wipe them out from football history has already been started. La Liga (Primera Division) games will now be played on other continents. The Premier League and the Champions League final are bound to follow soon. Article in yesterday's Guardian on prospects of Premier League following suit. Will it become like F1 touring the globe? Especially this is pure gold, though not news (yes, firms akin to Cambridge Analytica and Hill & Knowlton also play their part in football). Another key member of the team is the Australian Simon Pearce, also a Manchester City director, and Abu Dhabi’s head of strategic communications. Pearce made his name at the public relations firm Burson-Marsteller, whose work with clients such as Nicolai Ceaucescu, Blackwater and Union Carbide led to the famous quote “when evil needs public relations, evil has Burson-Marsteller on speed-dial.” Abu Dhabi made a direct hire and Pearce is charged with protecting and promoting Abu Dhabi’s reputation. What’s clear is that Manchester City FC and New York City FC enable Abu Dhabi to gain footholds in centres of power and influence, and provide a platform for the pursuit of further business opportunities which themselves consolidate and strengthen Abu Dhabi’s political influence. What’s not clear is whether that’s the primary purpose of their football interests, but Pearce’s emails point in that direction. Placing an abusive dictatorship under such bright spotlights is a high-risk strategy, as Pearce makes very clear, but he appears supremely confident of his ability to manage the reputational risks. He does this in three ways: firstly, by presenting the clubs’ owner as a wealthy benevolent businessman (Mansour), rather than an all-powerful statesman (MBZ); secondly by flooding the media with puff-pieces about how progressive the UAE is; and thirdly by attacking the credibility or the motives of groups and individuals who criticise the UAE’s abuses. Unfortunately, he’s very good at his job. That's how (football) history is made, erased or amended (and yes, my country is a big victim of that process; a gradual writing out and Orwellian erasing). But more importantly, they play their part in where football is heading to. Some fake, proxy half-baked argumented objections against overseas games, and job done. This gives the premier league all the financial leverage to disregard local fans and matchday support. If a match held at midnight Greenwich time can earn so much, why not move them to North America and Asia? Note: we see some of these things at national team level too. Or at other sports, with various sister organizations. Ferran Soriano: "We need to be very careful moving forward and avoid at all costs the perception of a cartel." Good to read in full. The big teams will own the competition, own the referees and cannot be relegated. The kingmakers. And this, from Man City, is just shocking. They had negotiated a massively reduced penalty for FFP cheating. Then a Man City lawyer, learning of the death of a UEFA FFP official , emailed: "1 down, 6 to go." I will now NEVER watch any ManCity match again. This is beyond House of Cards. Super League is a really bad idea, even for the big clubs, imo. Surely, they have to recognize the power of narratives. What gives UCL prestige is the domestic leagues. The reason doing well in the UCL means so much is because you're doing well against the best teams from the different leagues. That's where the narrative comes from. If the big teams are no longer part of their domestic leagues, and just all play in the Super League, where's the narrative? Madrid is about to play Chelsea? Who is Chelsea? Oh, they came 10th in the league of 20 clubs last year? Why do I care then? Compare that to a hypothetical match Madrid vs Chelsea, and the narrative is Madrid is no.1 in La Liga right now. It has La Liga's top goalscorer and the best defense. Chelsea has the best player in the EPL right now, and and this up-and-coming goalkeeper who could become the best in the world. Aren't you interested to see how they're going to match up? Can La Liga's best defense stop EPL's best player? Can this hot new GK make a name for himself by denying La Liga's top scorer? I would be all over it. The narrative is about winners and the best players in their respective leagues. In a super league, while there is brand name recognition, the teams that used to be prestigious because they are doing well in their own leagues before facing other elite clubs in the UCL, those teams become mid-table clubs. There is nothing exciting about mid-table clubs, especially in a league where finishing 2nd-7th probably won't mean anything because there is no elite competitions to go to beyond this. And there's not even relegation! What's the point! That is a good point but they will try to maintain interest to have two stages within the top tier. So Chelsea can play for qualifying to the knock-out rounds, just as the current Champions League. It is indeed important to not have 14 of the 16 clubs who play for 'nothing'. It is also good to recall that part of these plans are actually meant to curtail English football and try to prevent an NBA scenario. Agnelli, Rummenigge have admitted so in public (and they are afraid some clubs will win the CL many times in a row, with their club not part of the party). The hypothetical case of Chelsea will not be the most enthusiastic beneficiary per se, but might think they are obliged to join if the Spaniards, Germans, French and Italians team up anyway - with England once again left behind (will it then still matter to Abramovich?). English clubs are maybe the least willing to join ship, and the last to bail in. The draft proposal to include 5 English clubs looks generous, but is also divide-and-rule, if the 'will never relegate' Juventus will have Italy entirely for themselves. Chelsea can play for becoming champions of England. Anyway: your example of picking Chelsea is one of the vulnerable parts of this plan, precisely because Agnelli, Tebas et al. want to handicap English football (more precisely: Anglo-Saxon football, when thinking more broadly). I hope you are right, but just like the closed shop American team sports they might generate stories where every team plays for something. I am luckily not the only one to think English clubs are the least likely to accept (unless the sweetener is big enough). Orange14 said: "I already commented on this to BD's post on another thread. I really don't see this happening because English clubs won't depart from the EPL. Do you really think this 'super league' can guarantee teams €100M a season from television money? I don't. Of course Bayern want something like this because they see it a great way for more merchandise money and the fact that the Bundesliga don't get as much money from television. Both Barca and Madrid might favor this as well since they stand to lose TV money in Spain because the other clubs want more." Great to see Manchester City, buying titles with the worst money, but also needing huge corruption and massive cheating via the ruling bodies and main political powerplayers, humiliating a club who do much right for our entertainment. "Well done. Some achievement." The race to the bottom in dignity and class? Extensive study released today about good governance practices in sports. 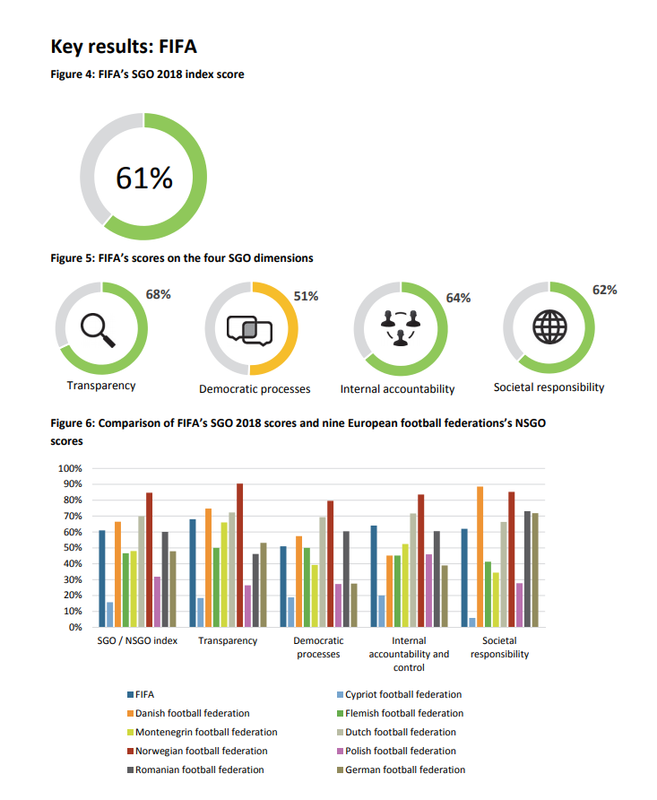 If there is one thing the findings demonstrate above all, it is that the degree of good governance in sports federations varies considerably depending on the home country (see figure). Sports federations in Norway, Denmark, and the Netherlands mostly achieve good to very good scores. Flemish federations generally achieve average to good scores. The federations in the other countries achieve mostly average to (very) weak scores. Achieving a low score does not automatically render a federation ineffective, illegitimate, or unethical. However, the weaker the score, the less likely that federation is to be effective, legitimate and ethical. The hackers collective of Football Leaks came up with some news this week. In short: a group of elite clubs want to set up a so-called 'Super League', entirely on their own. A closed super competition for sixteen superpowers, outside all existing football federations, which must generate billions of dollars. Lawyers from, among others, Bayern Munich, FC Barcelona and Arsenal are already busy with the fine print. Certainly, the revealed emails from Football Leaks yielded fascinating details, the ubiquitous greed is downright shocking, but the whole Super League story is years old. But more importantly: stay calm, people. That Super League will never come in a closed form. 1. Without the top clubs from the English Premier League it is a chance story. And the point is just: they have no interest whatsoever in stepping out of their own league. The Premier League gold mine gives them an enormous economic advantage over the Bayerns and the Barças. From a business point of view, it does not make sense to give that lead away. In addition, it is well known that their supporters attach much more to the English competition than to European football. 2. The leaked plans for the Super League had a very clear goal in 2016. They served to put UEFA under further pressure, intended to adapt the Champions League format to the wishes of the big countries. That mission succeeded. The four top countries were given their four guaranteed clubs in the Champions League. 3. An underexposed, but crucial point: in a closed Super League of sixteen clubs you can not escape losers. Half of the clubs end up irrevocably in the 'right-hand row', which means that it loses matches more often than it wins. That would be disastrous for the marketing value of, say, Juventus or Bayern Munich, clubs that derive their entire identity from 'winning', being successful. In a Super League they threaten to become a kind of NAC or Willem II. Disastrous. 4. It can not be ruled out that the Champions League will get another format after 2021, with even less space for subtop clubs like Ajax, PSV, Celtic and Benfica. It is possible that the entire 'branding' will change and the tournament will indeed be called 'Super League'. But that is something essentially different from a closed top competition, where Barça and Real actually step out of the Spanish League. A scenario that will result in countless claims and lawsuits. 5. Nobody wants this with their full weight, except for CEOs, lawyers and Arab sheiks. However defining money may be, football still lives by the grace of the public. An audience of millions that attaches great importance to identity, local rivalry and loyalty. Every Liverpool fan wants to play against Everton for another hundred years, much more than against AS Roma and that is not easy to suddenly change. With money a great amount is for sale in football, but not everything. The best structure for UCL would be to increase the number of participants and make it a true knock-out tournament (home/away) but make it double elimination. This opens up the tournament to more teams, instead of limiting it. Knock-out format gives smaller teams a better change of getting upsets, making it more exciting, and makes every game meaningful (no more inconsequential group games). Double elimination gives team a second chance so that if the Madrid of Bayern lose early, they can still come back and win, giving the establishment something they want. It'll also give us more worthy winners as well. Or just go back to the old format, the real European Cup championship I may add, with the UEFA Cup also back to its original format. The problem is that since 2016 the big teams sort of co-own the Champions League already. At least the commercial rights. The Economist: "More ominous still is the establishment of a new subsidiary company, UEFA Club Competitions SA, which will “play a strategic role in determining the future and the management of club competitions”. Half of the group’s managing directors will be appointed by the European Club Association (ECA), a group skewed towards promoting the interests of Europe’s biggest clubs. [...]The creation of a subsidiary company formally and permanently enshrines clubs’ influence over the competition." Other article, by Marcotti in The Times: "It’s not a coincidence that, in addition to the other changes announced on Friday in Monaco, Uefa have said they will enter into a 50/50 partnership with the European Club Association (ECA) and set up a new company to run the Champions League. In short, the big clubs will also be part-owners of the competition in which they compete." There's no point dreaming about that. Neither the establishment nor the vast majority of the fans want that. We just have to accept that the major countries will get 3-4 spots each. The key is how do create a format that allows more teams to compete with the major clubs. I did not know this. Pretty crazy that this is the case. If there is one thing the English has done right is the spread of commercial income. At least in England, all 20 teams in the EPL gets a sizeable share of the commercial income, which they help build.